I'm going to make a confession: I'm about two months behind on blogging my reading. This is really shameful, and I have no explanation other than the Vermont residency and school. 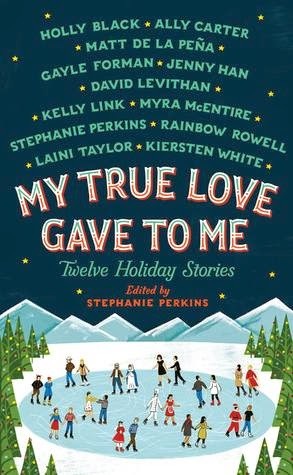 You all probably would have never noticed anything except, I'm going to talk about My True Love Gave to Me, a Christmas anthology, which I finished just two days before Christmas. However, I'm one of those obnoxiously cheery people who believes that a good Christmas anthology is perfect for any month of the year, so let's forge ahead, shall we? The first thing that smacks you in the face: This is an all-star cast. Seriously. Stephanie Perkins, Rainbow Rowell, Holly Black, Kelly Link, Jenny Han, Matt de la Peña, David Levithan, Kiersten White, Myra McEntire, Ally Carter, Gayle Forman, Laini Taylor...and yes, I did just try to sing all of those author's names out loud to the tune of The 12 Days of Christmas. It's difficult to talk about anthologies because I think short stories are more subjective to taste than novels are, and with twelve short stories, there are a lot of variables in this book. However, I've read quite a few anthologies this past year, and this one is put together very nicely, with a good balance between contemporary realistic fiction and speculative fiction. Every contributor is a great writer. For the most part, each writer sticks to the same genre as the novels they've published. Kelly Link's "The Lady and the Fox" is brilliant. It shines a little brighter than the rest, and it is possibly my favorite short story by her yet. Holly Black made me love her even more with her short story based on Krampus (think demon Santa, only Holly Black style!). Laini Taylor's short story about poverty and ancient magic is a little floaty, a bit meandering, but she can string beautiful words together like no one else. Jenny Han's story about Santa's daughter and the elves was extremely clever and surprisingly heartfelt. Kirsten White's story has just a hint of elusive Christmas magic and sweetness under sharp humor and perfectly deployed sarcasm. And while there isn't any magic in Ally Carter's story, it is a bit fantastical--a girl runs away from her life and discovers family and meaning at someone else's Christmas celebration. Matt de la Peña's story about a college freshman spending the holidays alone because he can't afford to go home was a surprising story about trust and relationships. Gayle Forman's story about first impressions, misconceptions, and making the best of a less-than-ideal situation made me laugh and think. And Stephanie Perkins's story about celebrating Christmas after your life has been upended was simultaneously heartbreaking and re-affirming. David Levithan writes about Christmas traditions and the lengths we go to to help others believe in magic. Myra McEntire's centers around the grand tradition of Nativity plays and how they can go wrong, yet turn out right. And Rainbow Rowell's absurdly adorable story about a friendship told through a series of New Year's Eves parties was both swoony and smart. That's a lot to take in, but there is so much about this anthology that will appeal to readers. It's a nuanced look at the holiday season, with all of its highs and lows and the expectations people hold for that particular time of the year. It was such fun to read a story every night in December, and it's a book that I'm definitely going to give as a gift for next Christmas. If you pick it up, just know that you might have 12 new favorite authors by the time you finish! Plus, how adorable is that cover? I want to hang it on my wall. Book purchased at my indie! I'd forgotten about this book. With snow still on the ground in my area, it sounds like a good book to read right now.